Twins who grew up in the role of the caretaker often struggle to not repeat that behavior in other intimate relationships. 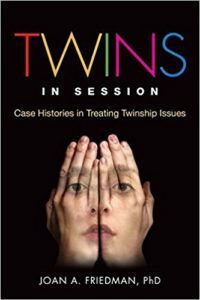 Even when a twin successfully discards this role with her sibling, she may consciously or unconsciously duplicate this behavior with friends, other family members, and significant others. An adult twin woman in her thirties, whom I will call Cherie, continually gets herself in trouble by putting the needs of her friends first. She has tremendous difficulty saying no to anyone. However, after she finds herself in unhappy and uncomfortable situations due to her reluctance to set boundaries and possibly hurt someone’s feelings, she ends up blaming herself and feeling frustrated, impatient, and sad. The latest incident occurred when Cherie made plans with a friend to go away for the weekend. At the last minute, another friend of hers, who had been having a rough time, asked Cherie if she could join them. Cherie instinctively recognized that the incompatible personalities of these two friends might be problematic. Unfortunately, Cherie did not have the courage or self-respect to tell her forlorn girlfriend that this plan was impractical. The weekend proved to be a disaster. Cherie spent every ounce of her emotional energy frantically trying to make everyone happy. Cherie’s weekend getaway was ruined. She felt guilty that neither of her friends had an enjoyable time and enraged with herself for allowing this to happen. She told me that she felt victimized—she tried to do the right thing for her friends and ended up feeling miserable and cheated out of her good time. Cherie and I have talked extensively about how she ends up feeling like a victim because of her lack of respect for herself. If she were confident and felt entitled to say no to others, she would not suffer the consequences of being manipulated to make other people happy. Certainly, becoming “self-ish” after one has lived a lifetime in the service of another’s well-being is not simple. Defining one’s happiness and feeling worthy of reaping the benefits is challenging. Emotional growth necessitates reflecting on one’s actions and nondefensively examining one’s role in the construction of repetitive behaviors. Cherie recognizes her conflict and understands that it is up to her to take control of herself in situations where she has difficulty confronting conflict and setting boundaries. I am certain that in time, she will develop the capacity to enjoy herself on her own terms rather than sacrifice herself.